This is one of my favorite projects I have made and am wanting to share it with you. It is such a light weight beret and easy to wear. This has part 1 and part 2! I used the Red Heart Crochet Thread size 3 and 3.5mm hook. The thread size 3 is the important part. I used the Red Heart Crochet Thread size 3 and 3.5mm hook. The thread size 3 is the important part not the make. Let me know if you have any struggles! I absolutely love the carbonation in soda's. I think I have figured out why. Keep reading and I will let you know my findings! Okay, so, I have ordered 3 different cultures (no, not people, lol) cultures as in eating and drinking. I have ordered Kombucha culture, Water Kefir Grains, and Milk Kefir Grains. What on earth is that, you may ask. Well the Kombucha culture is a living organism that you add tea and sugar to and it grows and makes you a delicious drink. You have to let it sit on your kitchen cabinet for a day or so and it produces all natural probiotics and yeasts that your body needs. Gives you a healthy flora in your stomach. This is what it looks like. I always tell people you can't say you don't like it until you try it. This actually gets to have some fizz like carbonated soda as well. There are many different recipes you can try out to make different flavors. So the reason I was saying I love carbonation is that I am probably needing to get my inner flora more balanced. When you take antibiotics, or just eating in our society now a days, you unbalance your flora inside and need the good bacteria and yeasts to balance you. This is one way that you can do it. I will post more on the milk kefir and water kefir later on. 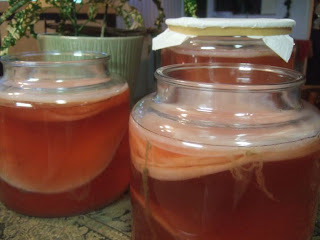 The water kefir can be very carbonated when you make the drink and add your syrup and let it sit on the counter for a few days. It gets really fizzy. I will continue with this post on another article. This is part 1 and the others will be part 2 etc. I also made a sourdough bread starter from scratch and I made mine gluten free. I haven't tried it in normal flour but will keep you posted. Have you ever heard of a niacin flush, oh my goodness I took niacin (vit b3) and gosh it was quite and experience - motto of that story is I need to start slooooooowww (take less initially) will tell you about that as well! Well will get back to my blog later this week and keep you updated on my Healthy Home! This is a nice variation of the ever so popular granny square. I love different granny squares as there is so much that you can do with them. I also love doing them in many different colors to spice things up a bit. I am a color fan and the more colors the better. Of course that is me and everyone is so different, which makes the world an interesting place. Anyway the pattern is below and the video link is below as well. Remember to Have Fun Crocheting! Well I thought that I would show you some of my art work, just for interest sake. I enjoy painting very much and never did art at school or anywhere. I remember my grandmother painting and had no desire to paint until about 8 years ago when I just decided to start painting. So anyone out there that has a desire to paint, my advice to you is to go and do it. You might be very surprised at what you can do! 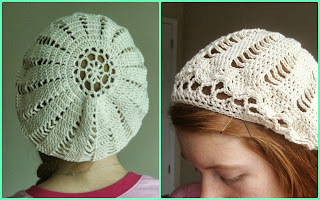 I have just uploaded a new video on How to Crochet a Hat in the Puff Stitch. I really enjoyed crocheting it and hope you have fun trying out the hat as well. If you have any problems let me know. The pattern is as follows (p.s. I am learning to write out patterns as it is easy to create something but different writing it out on a piece of paper! lol). To watch this video just click on the link. Puff Stitch = wrap yarn over hook, insert hook into st, bring up a loop, wrap yarn around hook, insert hook into st, bring up a loop, wrap yarn around hook, insert hook into stitch, bring up a loop, wrap yarn around hook and pull through all the loops (x3) all in the same stitch unless shown otherwise. 10. Same as row 9 until you have the length as you want it. 11. Ch1, Reverse Sc all the way around, 1sc in each sc, finish row by a ss and bringing yarn through stitch. 12. Change color and ch1 and then puff stitch in each sc all the way around. I hope the pattern is easy to follow, and you like the hat!